Super Bowl LII this Sunday has the potential to be an instant classic with the five-time champion New England Patriots taking on the red-hot Philadelphia Eagles, a team that has won three national championships before the NFL-AFL merger, but has never hoisted the Lombardi Trophy as a Super Bowl winner. It's a match-up between the greatest quarterback of all time (Tom Brady) versus a back-up quarterback (Nick Foles) that could create one of the greatest Super Bowl stories of all time if he can lead his team to victory this weekend. A potential classic? Absolutely! Okay, now we're going to bring this rivalry to the high school track. What would happen if athletes from Philadelphia's home state of Pennsylvania faced New England's home state of Massachusetts? 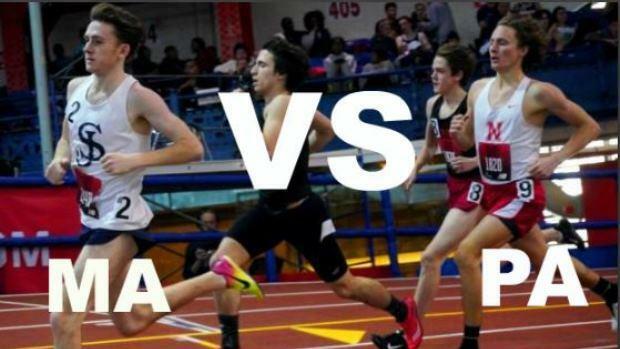 Due to the fact that the two states do not compete in all the same events at their State Meets, we took the seven common events that the two rivals contest at the state level - the mile, long jump, high jump, shot, 4x200m, 4x400m and 4x800m relays. We also added the DMR, which both teams have competed in several times this winter, and the short dash. With MA running 55m and PA running 60m, we used our conversion tool to rank those athletes. We then created a mock team score based on the top six finishers in each event, utilizing 10-8-6-4-2-1 scoring. The results are below. Take a guess who's celebrating?